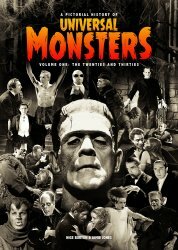 Direct to MyMovieMonsters.com from the creators of Classic Monsters of the Movies magazine in the UK: Take a trip through history with this beautiful guide to the golden age of Universal monster movies. A Pictorial History of Universal Monsters Volume One: The Twenties and Thirties is a breathtaking chronicle of horror cinema's early years. We ship same or next day so don't wait for the UK! The horror movies produced by Universal during the 1920s and 30s were crucial in shaping our understanding of what a horror movie could be. They created the environment in which artists such as Lon Chaney, Bela Lugosi and Boris Karloff could flourish, and became a turning point in the development of the modern motion picture. 84 pages, perfect-bound. Full color throughout. Packed with photos, posters, articles, and info. Printed and finished to the highest standard on thick paper stock. While supplies last we also offer issues of Classic Monsters of the Movies magazine, additional Ultimate Guides, the Scrapbook, and The Monsters Day-By-Day Almanac. Shipping Note: Save on shipping by purchasing this magazine and one or more additional magazines. This magazine alone, with the cardboard shipper, weighs more than 1 lb and must ship Priority Mail rather than First-Class. Indicate at the drop-down menu above if you wish to purchase this magazine by itself (Priority Mail postage will be added) or if you have additional magazines or other items in your order. If you choose "also other mags or items" but only purchase this item, your order will require postage and your order will be delayed.